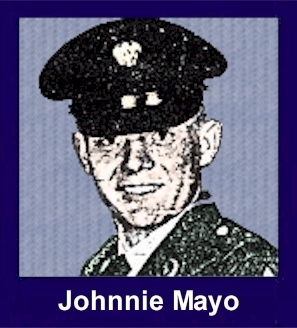 The 35th Infantry Regiment Association salutes our fallen brother, PFC Johnnie Murray Mayo, who died in the service of his country on March 21st, 1967 in Kontum Province, Vietnam. The cause of death was listed as Small Arms/AW. At the time of his death Johnnie was 19 years of age. He was from Chocowinity, North Carolina. Johnnie is honored on the Vietnam Veterans Memorial at Panel 17E, Line 8. The decorations earned by PFC Johnnie Murray Mayo include: the Combat Infantryman Badge, the Bronze Star with V, the Purple Heart, the National Defense Service Medal, the Vietnam Service Medal, the Vietnam Campaign Medal and the Vietnam Cross of Gallantry with Palm Unit Citation. Johnnie is buried in the Wesley Cemetery, Chocowinity, North Carolina.Johnnie rests beside his Dad. You are not forgotten. Johnnie was such a young soldier ~ a handsome young man as I remember. His brother Bobby Ray and I were very much in love when they both were in Vietnam. So often I have thought of both with such fond memories. Your mother Goldie was so very much proud of you and Bobby for your service to our country. I am sure she never thought you would pay the ultimate sacrifice for your country. Bobby recently told me that on her death bed she said, "Johnnie is here with me. Do you see him standing over there?" Recently I visited "The Wall" where I found your name. I had the park ranger trace your name, took a picture where your name is inscribed and purchased a memorial ribbon all of which I sent to Bobby. Maybe some day Bobby will get to visit the wall himself. Fond memories from a friend who could (or maybe should) have been your sister-in-law. Delores Staley-Spraker. Johnnie was a resident of Beaufort County, town of Chocowinity. I visited his grave yesterday 5/22/2005. His funeral was my first military funeral one day after I turned 17. I never really knew this man, but I am proud to say he was my cousin and fought for our country! Thank you Johnnie. Jacqueline Harris, 2390 Lighthouse Lane, Greenville, North Carolina, 27858, harrisj@mail.ecu.edu. He is the son of Lawrence Murray Mayo and Goldie Dee Banks Mayo, Route 1, Chocowinity, NC.